At Manifest Books we provide books, CDs, DVDs and more that help people learn how to be Conscious Creators and Master Manifestors, using the Law of Attraction and other essential tools of Universal wisdom. Our goal is to give people the knowledge that enables them to live happier, more successful and satisfying lives and to bring forth a healthy, abundant and compassionate world. A vital tool for anyone wanting to Consciously Create love, joy, peace and prosperity in his or her life--and bring the same to the world! 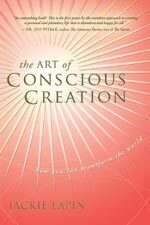 The Art of Conscious Creation, How You Can Transform the World is humanity's guidebook on how to begin Consciously Creating the world, rather than allowing Unconscious Creation to rule our lives and our habitat! This revolutionary manual empowers people everywhere to use their power of Conscious Creation to change the their own lives and the world--for the better! The consummate Conscious Creation teacher Jackie Lapin offers a step-by-step approach to mastering the ability to manifest your hopes, desires and dreams much faster and with greater abundance! The book provides practical instruction on how you can put the 25 Guiding Universal Principles to work for you. Once you've mastered the skills, you'll want to join in shaping the future of the planet with this book's 17 powerful Visions for Healing the World. The Secret's Joe Vitale called it the first "paint-by-numbers approach to creating a personal and planetary life that is abundant and happy for all." If you care about the world, this book is a win-win because as you begin to increase your happiness and manifesting ability, you can help heal the world.